Warp into action with WizKids/NECA's latest installment to the Star Trek franchise! Designed by Mike Elliott and Ethan Pasternack, this stand alone strategic space exploration/ship-to-ship combat game will primarily focus on the eclectic Star Trek ships as they explore space and battle their opponents. 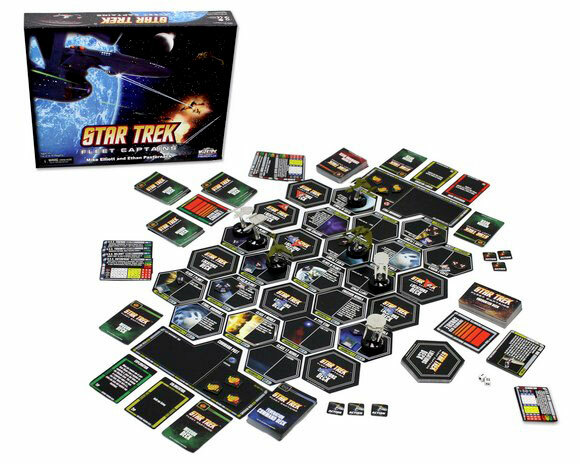 Featuring 24 precisely crafted 3D HeroClix starships and over 300 cards, this game is a must-have for any Star Trek fan! 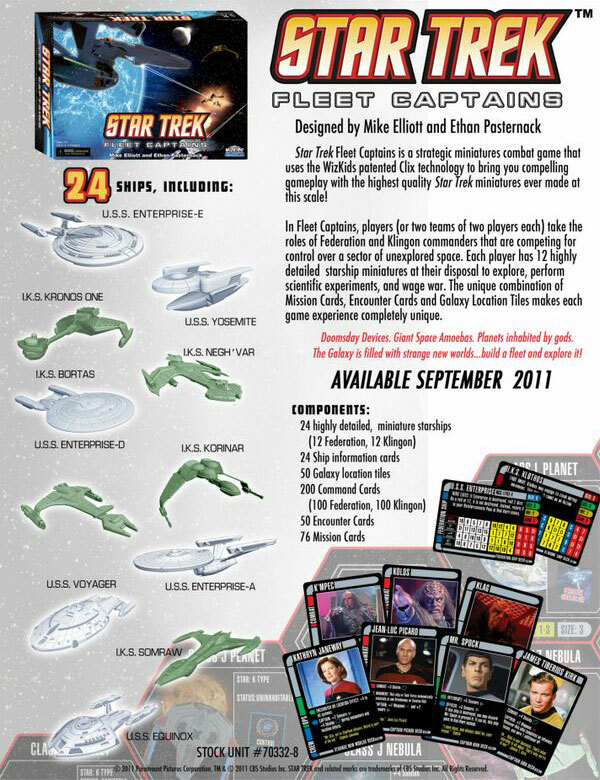 Star Trek: Fleet Captains is a game for 2-4 players (or two teams of 2 players each) as they assume the roles of Federation or Klingon commanders and compete for sector supremacy! So ready your phasers as we expand into the final frontier…and beyond! While many people might say this game falls flat, I am a huge fan of it. The Star Trek theme itself plays a large part in the game, and if you are a big fan of the franchise, this game will give you a lot of smiles as you see the cards and encounters. Each play through is almost like its own episode, and it’s easy to tell a story based on how the game goes. But many people will focus on the mechanics, so that’s where I will focus this. The modular board with hex tile cards was the main reason I considered this game. Even though I was already a big fan of the series, I was interested in the idea that it allowed you to explore a “new sector” of space each time. I generally like that in a game, which is probably why I am a fan of others such as Eclipse and Civ where the board is new each play through. The combat can be very straight forward, but the decks you choose make it varied enough that there is a genuine strategy to it. The components, however… fell far short of expectations. The ships are made well, but the clix bases gum up far too easily straight from the mold. I had to disassemble most of them and file down some burrs inside to make them run smooth. The cards are on linen paper and are far to thin. They begin to fray within 4 or 5 plays, so you really need to use sleeves right away. If you are a person who generally does not use sleeves, use them for this game. As for the hex cards…. that’s a bit harder. Just be careful with them, and maybe consider laminating them. They they are fine. And honestly, the dice that come with this game are far too tiny. They are like little peas. Get your own pair of D6’s to use. All in all however, if you are a Star Trek fan, you will like this game a lot. Even with its failings, I still give it a 10 because I just love the game play so much and the replay value is extremely high. No two games will be exactly the same. Keep in mind that I have been a fan of the series for about 15 years now, and I play it with other fans of similar backgrounds. So if you can call yourself a “trekkie”, this game’s for you. A game that represents very well the concept of Star Trek: lots of exploration and influence, but also a good fight when one is needed. Choose command decks, reveal regions of unknown space, move miniatures, change the clix of your ships, throw dice, put tokens on the board, draw command cards, draw mission cards, draw encounter cards. You score points for destroying enemy ships, building starbases, completing missions and resolving some encounter cards. You can play as Federation or Klingon Empire. The winner is the player who achieves a number of points equals to the initial size of the star ships. Lots of decisions, some are free, some cost actions points. Such actions can be executed in any order you want. – You must choose four (out of ten) decks to form your command deck. – Attack another ship. To attack another ship you may play one command card before or after your opponent plays it’s card. You can also decide to attack with more than one ship. This game is a great experience with lots of different and interesting decisions to make. Each turn a good story is developing, an adventurous story with tension, danger and happy moments. The manual is confuse, lacks information and does not have an index. But this is a minor problem that can be easily solved by downloading several user created files available at boardgamegeek. The clix is also a problem, because sometimes it is difficult to rotate the base and this game really does not need such feature. The same effect could be accomplished with markers on the cards. Also, some people may be bothered by the thin board tiles but I don´t mind, they are easier to shuffle. Finally, although there is lucky, you can protect yourself against bad results most of the time. During the game you feel the antecipation of discovery and the tension before a battle. After the end, you feel like you participate in several small adventures during a season of Star Trek. It is a must have for Star Trek fans. I will start off by saying that I really enjoyed playing this game. I’ve only ever played the three player variant with Romulans and Dominion included rather than the base game in its pure form but everything I have to say should hold true. Firstly – the game has great atmosphere and seems to replicate the feel of the setting very well indeed. The factions all seem unique and the game makes every effort to recreate the feel of them with unique ships, command cards, quest balances etc. It plays fairly fast although is slowed down by having to pick carefully over the rules which are fairly unclear in a number of places. It is also a great deal of fun with there never being a point where anyone in the games we played felt like a hopeless underdog or a run-away victor. The issue is related to that last benefit. A lot of that variation in being able to rise of fall is due to the randomness of the game. Encounters, in particular, vary pretty much between more or less randomly advancing you towards victory or completely crippling a ship. The quest cards have a similar problem in that some of them seem night on impossible to complete and others are likely to be already complete at the point you gain them. This high degree of random chance does leave you with a feeling that your tactical and strategic decisions are somewhat diminished. On the other hand it offers sufficient variability that it makes each game feel significantly different to the last. This game is flat out amazing. Every game is phenomenally different, every game is great, and those MINIATURES are gorgeous. The quality of the cards used for the “board” are poor. The ability to randomize character decks, space decks, mission decks, and choose 2 different races expands the universe so much. The entire game is steeped in Star Trek – each card provides great flavour and excellent immersion into the story of the game. Thank you WizKids for this amazing game. Add a Review for "Star Trek: Fleet Captains"